Update: Apparently a number of you are receiving the update via OTA, contradicting what the above document says. 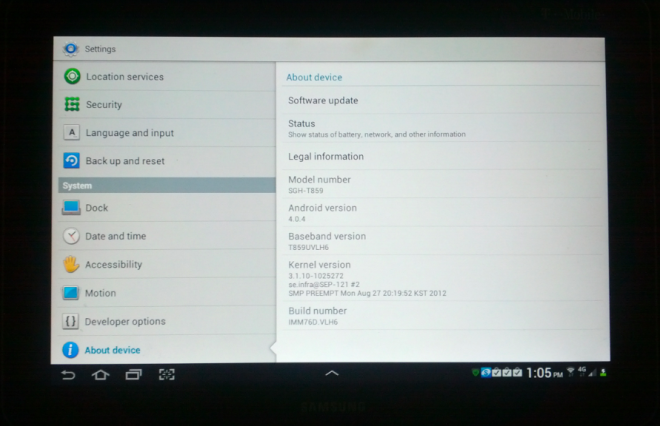 Samsung Galaxy Tab 10.1 owners woke up nice surprise yesterday as T-Mobile released an optional Ice Cream Sandwich update. T-Mobile does give a quick note for everyone thinking of upgrading — advising them that the Ice Cream Sandwich update will wipe the home screen layout, so be advised of this change before proceeding ahead with the update. The update requires manual installation via Samsung’s Kies software, and will not be delivered via any future Over-the-Air (OTA) update. 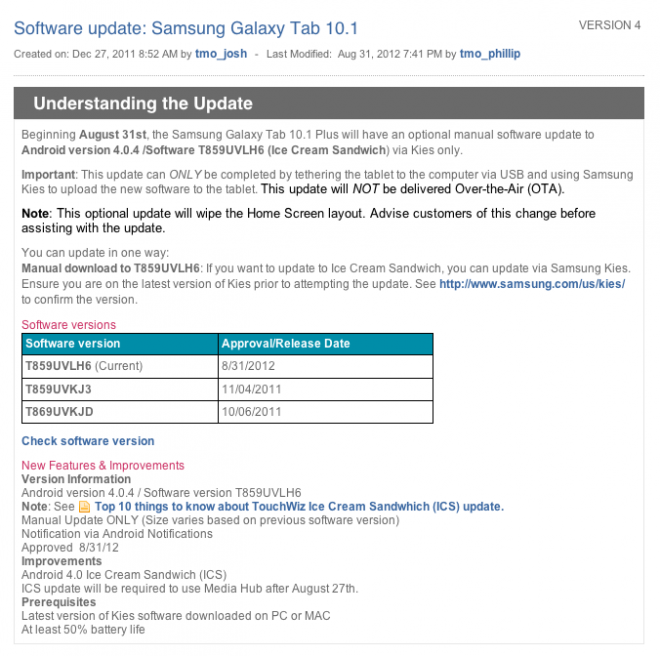 Note: See Top 10 things to know about TouchWiz Ice Cream Sandwhich (ICS) update. ICS update will be required to use Media Hub after August 27th. Installation instructions are available at the T-Mobile link below, so get started. Great news for og tab 10.1 owners. There was a lot of complaints about this. Im glad its finally here. I got it for my wifi only tab last week. Much to my surprise it worked perfectly. (Previous updates have often randomly hung during the update and required a power cycle.) Not only that everything was preserved – I had expected to lose some data or apps, but all that went flawlessly. Heck even my rooting and su was kept. Except as mentioned I had to put icons back on all my home screens – I really wish they had at least migrated the placement information. this tablet should have got jelly bean. i cant believe its just getting ics. this is why i went to the galaxy nexus. i get tired of t-mobile taken forever to approve updates. now i get the updates straight from google and i love it lol. Oh my good Lord, finally Sammy comes to term. It was a long wait though. Got my ICS OTA just now(I didn’t check for the update till just now.) Good stuff.